So, you’re replacing your PAR can bulbs and you are wondering what you need to keep in mind as you choose right one for your needs. This article is intended to help consumers decide which PAR can replacement bulb is for them. When replacing your PAR can bulb, the first set of considerations you need to make regard the bulb’s essential specifications, namely voltage, wattage, and base. With regard to voltage, your replacement bulb has to match your existing bulb or else you risk damaging your lighting system. As far as replacement bulb wattage is concerned, you may choose a PAR can bulb with equivalent or less wattage but never a bulb that exceeds your original bulb’s wattage. Choosing a bulb with too high a wattage presents safety risks to not only your equipment but to you as well, so be clear on what wattage to choose. Your replacement PAR can bulb also needs to match the original bulb’s size. A PAR64 lamp, for example, needs to be replaced by another PAR64 lamp to ensure proper fixture fit and comparable performance. PAR can bulbs also vary with respect to base. Different PAR can bulbs will have different bases depending on the bulb’s application. Many PAR30 bulbs used for recessed lighting and PAR16 bulbs used for track and accent lighting will have E26 screw bases so your replacement bulb will have to match the base. PAR56 and PAR64 bulbs intended for use inside PAR can in stage lighting applications will feature mogul end prongs or other types of bases that will need to be matched by their replacements in order to be compatible. Lastly, consumers should be on the lookout for improved products that can optimize the performance of their lighting systems. 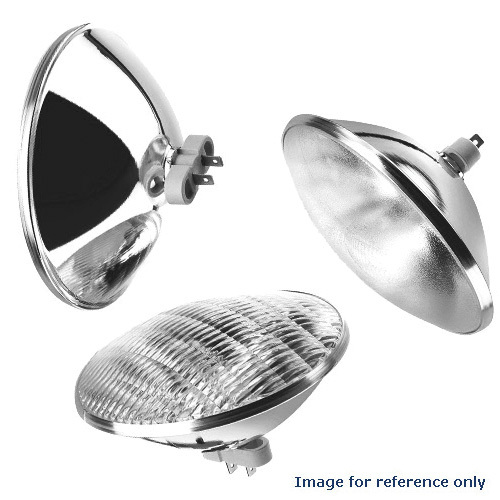 With recent improvements in reflector technology, many PAR lamps are more powerful and more lightweight than their predecessors while coming in the same standard shapes, bases, and sizes, making them ideal for replacing burnt out PAR can bulbs. Osram’s aluPAR 1000w PAR 64 lamps are an example of this type of technological improvement. The aluPAR series lamps feature an aluminium reflector instead of glass, making them lighter and easier to use and install. The aluminum reflector allows the aluPAR PAR 64 lamp to perform more efficiently by avoiding backspill and producing a cooler beam of light because of better light dissipating than glass reflectors. Osram’s aluPAR lamps are great replacements for standard PAR64 bulbs and can be used on stage and in architectural applications. BulbAmerica has your PAR can bulb needs taken care of. From PAR16s to PAR64s and every size in between we have the PAR can lamp for you. Please leave a comment or question on our blog or Facebook or call us at 1-877-622-0897 with any remaining PAR can questions you have!